Fevr is an professionally graphically designed, powerfully pliable and feature-rich, technologically resourcefull and highly customizable, fast and elegant Creative MultiPurpose Theme that performance matters and this will blow your mind. 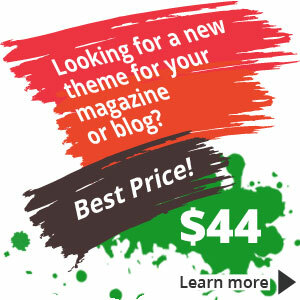 The fastest multi-purpose theme on themeforest. This theme is a new generation of WordPress Themes that provides pre-cofnigured schemes, extreme customizations, use to use solutions, amazing performance and clean and readable code. You get tons of features. This theme is packed with 50+ pre-defined page templates, its responsive and retina ready, 24+ stunning homepage concepts plus 150+ pages included and available to import via a single click and its WPML ready. Also, this theme includes premium plugins such as Visual Composer, Revolution slider, Layer Slider, iLightbox and Swift Security Bundle. You will save 122$. Grab this theme if you can. You get lots of features for its value!